Kolibri Kolinsky brushes are handmade in Germany by Feurer & Sohn -- one of the oldest brush manufacturers in Germany (established 1898). They are made by dedicated brush makers, using the highest quality hair obtained in Russia from raw kolinsky tails and dressed by the brush maker. This is pure Kolinsky, not a mix of hairs, so the brushes point and snap as only pure Kolinsky brushes can. 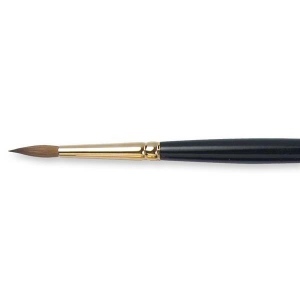 Kolibri Kolinsky Round brushes have long hair length out, which is ideally suited for painting 'long' oil colors and the sharpest details with fluid paint. The winter fur from the tail of the Siberian male Kolinsky makes the best soft-haired brushes because of its unique properties. It's extremely soft and supple, yet strong and elastic. Crafted to take advantage of these special qualities, Kolibri Kolinsky brushes are made with longer tapered Kolinsky hair, hand-cupped by our expert brush maker to produce a precise chisel edge. A dense hair count and full, tapered belly maximizes the brushes' holding power. The hairs are deeply set into the seamless gold-plated ferrules, producing excellent spring and control, and return to a point immediately when raised from the painting surface. The ferrule of each Kolibri Kolinsky brush receives two deep crimps. Deep crimping compresses the walls of the ferrule into the wooden handle, creating a mechanical lock that securely fastens the ferrule to the handle. The short black polished handles are made of hardwood and are lacquer finished for long life. Only the best brush handles are dipped. They are made by lowering the handles first in primer, then twice in colored lacquer and finally in varnish -- a total of four coats -- for a lustrous durable finish. For ease of handling in both a pencil or palm grip, the hardwood handles are 25 cm (10 in.) from the ferrule to handle end. The long handle permits you to stand back from the painting while working to have a better view of your subject. When you see the term "Kolinsky Sable" it is not really from sable at all, but comes from the tail of a species that is a member of the weasel family (Mustela) found in Siberia and northeastern China. The best Kolinsky brushes are made with hair from the tail of the male animal's winter coat. Although Kolinskies are also found in northern China and northern Japan, the best hair is from animals in the northern-most parts of Siberia. Kolinskies must be trapped in the wild as opposed to raised on fur farms as mink are today. Kolinsky hair is generally conceded to be the best material for oil and watercolor painting brushes due to its strength, spring and ability to retain its shape (called "snap"). It holds a very fine point or edge. This is considered a professional grade of hair, and if properly cared for, Kolinsky brushes will last for many years.